Searching for a home within the Dommerich Elementary School Zone? Then you are in the right place! 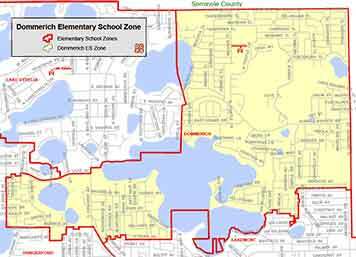 Students of Dommerich Elementary reside within the 32751 and 32789 zip codes. Dommerich Elementary was established in 1965 serving students in northeastern Orange County and the cities of Eatonville, Maitland, and Winter Park. The new Media Center was dedicated to a former principal, Robbie McNabb, who served our community and school for over 15 years. Directly across from the Media Center, and visible within the first few steps into the school lobby, lies a beautiful hand-crafted mosaic created by students and community contributors. This new facility, coupled with the dedications and celebrations of the past, creates a sense of nostalgia and pride in our Dommerich neighborhood school. After School Programs: YMCA – after school care is offered until 6pm. After School Specials - our PTA offers a variety of 6-week courses in fall and spring semesters. Past courses include Art, Chess, Typing, Team Sports, Rosetta Stone Spanish, Hip Hop, Zumba, Cartooning, Guitar, Photography, and Lego Robotics. Scholarships and transportation are available.